Rektor Kainz und Professor Fellner überreichten am 8.4.2019 DI Johannes Edelsbrunner die Urkunde der Nanyang Technological University, Singapur. Edelsbrunner absolvierte als erster Outgoing Kandidat in Singapur das Joint PhD Programm Visual Computing. Informationen zum Joint Doctoral Programme Visual Computing finden Sie hier. Wir stellen Ideen für Master- bzw Bachelorarbeiten und Seminar-und Masterprojekte im Sommersemester kompakt & unverbindlich vor - z.T. auch bezahlt im Rahmen von Projekten - first come, first serve! Dienstag, 12.3.2019, 13:00 Uhr, im Seminarraum des Instituts, Inffeldgasse 16c/2. Stock. Die Arbeitsgebiete umfassen ein breites Spektrum von Themen in der Computergrafik z.B. CAD/CAGD, prozedurale Modellierung, 3D Ähnlichkeitssuche, virtuelle Restaurierung von 3D Objekten, 3D Realismus, Simulation und Animation, als auch visuell-interaktive Datenanalyse (Visual Analytics, visuelle Suche) sowie Digital Libraries Technologien. Mittwoch, 6.3., vormittags im Seminarraum des CGV (Inffeldgasse 16c, 2. OG). Bei Kaffee und Waffeln kann man sich entspannt über Bakk.- und Masterarbeitsthemen unterhalten. Die konzentrierte Themenvorstellung (ohne Frühstück) findet dann nochmals am Dienstag, den 12.3., um 13:00 Uhr, im Seminarraum des CGV statt. Nach dem Motto „Ein leerer Bauch studiert nicht gern“, freuen wir uns auf Euer Kommen. 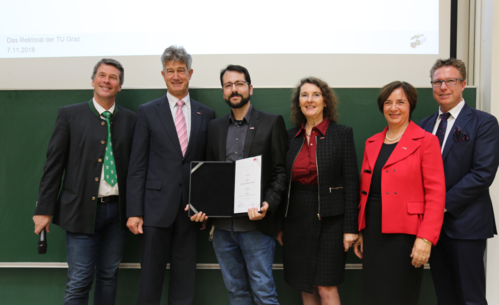 Amir Dini receives 2018 TU Graz Prize of Gender and Diversity for Master Project on "Enjoyment Training for a Fulfilled Life"
As part of the master project "VR-SenseCity", which was supervised by the Institute for Computer Graphics and Knowledge Visualization, Fraunhofer Austria (advisor Dr. Volker Settgast) and the JOANNEUM RESEARCH DIGITAL, Amir Dini has developed a virtual environment for the enjoyment training of elderly people. The program seeks to activate the five senses and the associated personal experiences and motivates for a mindful, meaningful life in everyday life. The users are put into an archetypal scenario that enables a journey between sensory portals, each providing virtual access to enjoyable sensory experiences. VR-SenseCity enables intuitive interactions as well as attention and emotion measurements for a detailed analysis of the mental state of users. The studies showed that the mood of the participants after the experience were higher than before, with a significant increase. The master project was financed by the Future Fund Styria (project "SenseCity") and the JOANNEUM RESEARCH DIGITAL and co-operatively developed with partner organizations FH JOANNEUM and GEFAS. Amir Dini (third from left) at the price reception together with the rectorship of TU Graz. More information can be found here. We congratulate Ulrich Krispel to the successful defense of his PhD thesis titled "Generative Methods for Data Completion in Shape Driven Systems" on November 14, 2018. In his thesis, he presents novel approaches for generative forward and inverse modeling, with applications among others in processing and analyzing digital building models. 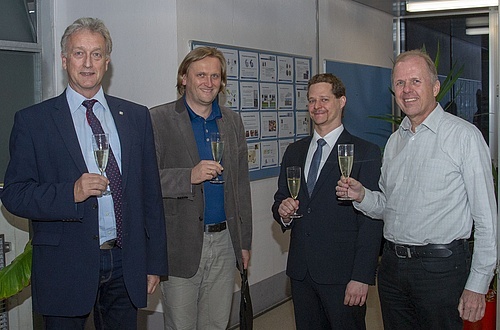 The image shows Ulrich Krispel together with his advisor Prof. Dr. Dieter W. Fellner (TU Graz and Fraunhofer IGD, left), co-examiner Prof. Dr. Werner Purgathofer (TU Wien, right), and head of the PhD examination, Prof. Dr. Gernot Müller-Putz (TU Graz, second from left). We currently have a PhD researcher position available in the area of Geometry Processing. Please see the opening descriptions and contact us if interested. We congratulate Johannes Edelsbrunner to the successful defense of his PhD thesis titled "Domain-specific Methods for Procedural Modeling of Historic Architecture" on June 14, 2018. Johannes' thesis was co-advised by Priv.Doz. Dr. Sven Havemann (TU Graz and Dassault Systems, second from right in the image) and Prof. Dr. Alexei Sourin (Nanyang Technological University, Singapore). 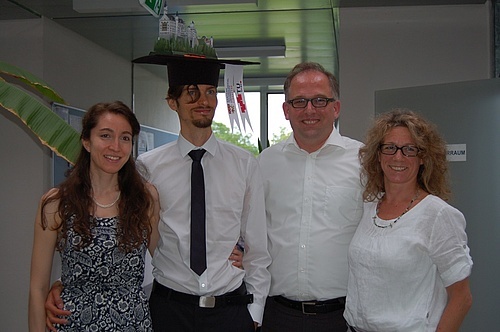 Johannes is the first Graz alumni of the joint PhD Program in Visual Computing between TU Graz and NTU Nanyang. The work of Johannes included a one year research stay at Nanyang. For more information on the program see the program webpage. Please also refer to the application possibilities to the program if you are interested. We congratulate Christoph Schinko to the successful defense of his PhD thesis titled "Shape Processing for Content Generation" on March 12, 2018. His thesis presents work on generative modeling, novel applications for inverse generative modeling, and visualization systems. 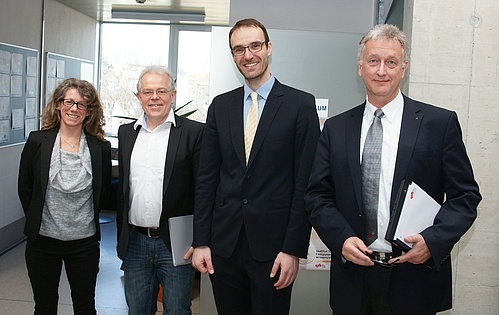 His advisor Prof. Dr. Dieter W. Fellner (TU Graz and Fraunhofer IGD, right in the image) and Prof. Dr. Reinhard Klein (University of Bonn, second from left in the image) were the members of the board of examiners. (Darmstadt, Germany/ Graz, Austria) In honor of his distinguished career and achievements in the advancement of computer graphics, Prof. Dr. techn. 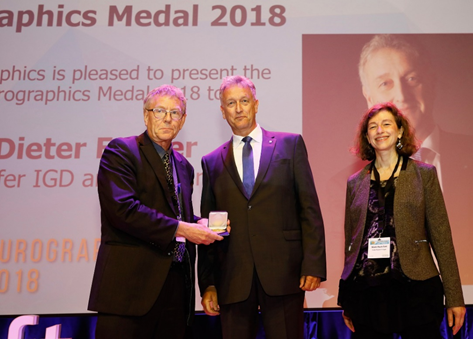 Dieter W. Fellner has been awarded the 2018 Eurographics Gold Medal. This award from Eurographics (the European Association for Computer Graphics) recognizes Fellner not only for his research: It is also an acknowledgment of his many years of leadership within the Eurographics Association. Fellner holds the positions of Professor of Computer Science at the TU Darmstadt and Institute Director of the Fraunhofer Institute for Computer Graphics Research IGD since October 2006. The native Austrian is still connected to his place of study, Graz, where he not only completed a degree in technical mathematics in 1981, but also earned his doctorate and post-doctorate in 1984 and 1988, respectively. In 2005, he founded the Institute for Computer Graphics and Knowledge Visualization at the Graz University of Technology, which he still leads today. He also serves as Managing Director of Fraunhofer Austria Research GmbH since 2008 and is a board member of Fraunhofer Singapore, which was recently founded in 2017. The Eurographics Gold Medal honors association members who excel at supporting the goals of Eurographics, whether through groundbreaking research, outstanding teaching, or the successful completion of a role within Eurographics. We are looking for students who want to participate, during their Bachelor or Masters Project and Thesis, in research on areas of Geometry Processing, Simulation & Analysis, Visual Analytics and Digital Libraries. We will present our topics during the topic presentation event on 07.03.2018 from 10:00 to 15:00 Uhr in the foyer of Inffeldgasse 25d, organized by the study council together with the faculty. CGV, Fraunhofer Austria and Joanneum Museumsakademie are jointly organizing the 15th EG Workshop on Graphics and Cultural Heritage (GCH) 2017, September 27-29 in Graz, Austria.The objective of the workshop is to introduce and showcase new techniques and applications for supporting Cultural Heritage information ranging from data acquisition, analysis and synthesis, 3D documentation, and data management, to new forms of interactive presentation and 3D printing solutions. To book your attendance, please see http://gch17.tugraz.at/ for further information. We welcome you to EG GCH 2017 in Graz! Dr. Dirk Lehmann visited CGV for a Guest Professorship during this summer term. In his lecture on "Data, Visualization, and Visual Analytics" students were given an introduction into the topic. Seit 2007 kooperieren die beiden Fraunhofer-Standorte an der Technischen Universität Graz und der Technischen Universität Darmstadt. Unter der Leitung von Prof. Dr. Dieter W. Fellner, Geschäftsführer von Fraunhofer Austria und ebenfalls Leiter des Instituts für Computergraphik und Wissensvisualisierung der TU Graz, entwickeln die Forscher Lösungen für die 3D-Visualisierung. 28 June - 08 July 2016: CGV hosted Prof. Dr. Benjamin Bustos as a visiting researcher. He gave a lecture on "IMGpedia: Enriching the Semantic Web with Image Meta-Data"
Virtual Reality (VR) Techniken erleben derzeit einen neuen Boom und ermöglichen faszinierende neue Anwendungen. An der TU Graz wird seit Jahren an der Erforschung und Entwicklung von VR Technologien gearbeitet. Im Rahmen der 1. Grazer Virtual Reality Night zeigen wir aktuelle Projekte, wie DAVE und TILED Display, und demonstrieren Möglichkeiten der neuesten Gerätegeneration, wie z.B. Microsoft HoloLens und HTC Vive. Sowie Anmeldeinformationen können der Einladung hier entnommen werden. Um besser planen zu können, ersuchen wir um Anmeldung per Email an vr-night16@cgv.tugraz.at bis zum 22. Juni 2016. Wir freuen uns auf Ihre Teilnahme. am 31. Mai 2016, ab 17 Uhr, in Graz, Campus der TU Graz, Inffeldgasse 16c/2.OG. Treffen Sie Kollegen aus Industrie, Wissenschaft und Wirtschaft auf unserer Frühjahrsveranstaltung zum aktuellen Thema „Innovationen in Datenverarbeitung & Visualisierung“. In zwei spannenden Fachvorträgen möchten wir Sie gerne über die Anwendung von aktuellen Visual Computing Methoden im Bereich Design, Planung und in der Konstruktion informieren. Zur Diskussion dieses Themas haben wir Prof. Dr. Arno Eichberger vom Institut für Fahrzeugtechnik der TU Graz und Dipl.-Ing. Nelson Langkamp, Geschäftsführer der Firma ByteFex, gewinnen können. Wir werden Ihnen innovative Methoden zur visuellen interaktiven Suche in großen Datenbeständen und eine Reihe von Praxisbeispielen vorstellen. Details zum Programmablauf sowie weitere Informationen entnehmen Sie bitte der Einladung.